Not all containers are created equal. That is to say, no one container is created to hold all products. Containers are designed and manufactured for specific uses, or at most a handful of uses. Thus, choosing the right packaging for your product is essential to ensuring that your product is useful and provides value to your customers. This can be a daunting task, however, considering there are many options of packaging to choose from. You may have a general idea of where to begin but still have a few questions in your mind. Do you need bottles or tubes, cans or pouches? What option is going to be most cost-effective while still conveying the design and message you had in mind? 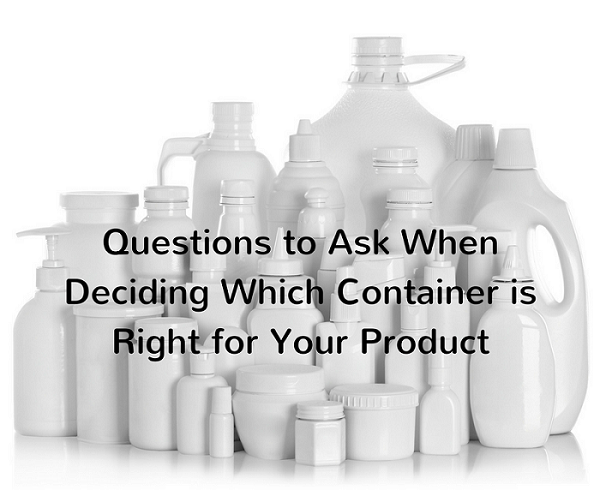 Consider the following questions when deciding which container or packaging is going to be the best for your product. What’s going inside the container? Perhaps the most important thing to consider when choosing the right container for your product is what is going inside. First and foremost, you should take into consideration how your product dispenses. Will your customers be pouring the product? A bottle might work best in this case. If your customers will be touching the product directly, a squeeze tube will allow them to dispense the product into their hands. If they will be using a tool such as a brush to use your product, packaging your product into a can could be the best method. Is your product highly viscous, i.e., something that is easier to scoop out of a tub than pour out of a jar or bottle? The use and consistency of the product will influence its container. You should also take into account how long your product will last before it expires. The container you choose can often prolong the shelf life. If your product is liable to expire quickly, choose a container with a resealable lid. Additionally, if your product is sensitive to light, a container that is thick and opaque may be recommended. Odds are you have spilled your heart and soul into your product—thousands of hours and dollars have gone into planning and concocting it. The last thing you want to do is skimp on the packaging and call it a day. Truth be told, you can have the best product on the market—the magic elixir that will solve all of your customer’s worries and woes—but if it doesn’t look as attractive as the next brand, it will most likely be overlooked. A good way to envision your product is to imagine it sitting on the shelf at the store. Think about how it will catch the customer’s eye as they walk down the aisle. What colors does your brand use? How large do you need your container to be while still keeping the packaging attractive? Will they find your choice of packaging visually appealing and useful? In all reality, the container you choose will make or break your sales, even after all of the time and effort you put into the actual production. Could you benefit from flexible packaging options? There have been many advances in the design and utility of packaging over the years, and flexible packaging is one of the most successful and popular options these days. This new type of container has seen unprecedented growth in the past year, and for good reason. For one, flexible packaging is more resilient than its rigid packaging counterpart. It is less likely to be damaged by being crushed or enduring unexpected falls. Not only is it durable, it is also much more compact, which is great for both you and your customer. Flexible packaging will take up less space than other packaging methods and is much lighter than other options. This means flexible packaging requires less material to produce which can reduce strain on the environment—that’s a huge selling point to some customers. There are also seemingly endless design options that allow you to be creative and make your product stand out against your competitors. You can significantly defray your shipping costs if you take some time to consider the logistics of how your product will be delivered. For example, flexible packaging options can decrease shipping costs by as much as 85%. Keeping your shipping costs low will be a huge benefit for both you and your customer. Shipping your product in larger containers may be more convenient and cost effective than sending a number of tiny containers, but this is also dependent on how the customer is receiving the product. Are you a big operation shipping large quantities to stores, or are you running a small online business that delivers directly to the customer’s home? Home delivery is a huge trend right now, and many companies are putting a ton of effort into the presentation of the product when it’s delivered—that’s another factor to keep in mind. Put your container needs in our hands. Fortunately, you are not alone on the journey to deciding which packaging is best for your product. Let the experts at SLC Custom Packaging help you determine the optimal container or packaging for your product. Our 70,000-square-foot facility allows us to handle small runs of products all the way up to tens of thousands of line items. Contact us today and let us help you find the perfect packaging for your product.